On April 25, 2001, the Nigerian government committed to spending at least 15% of their budget on health care for its citizens. 15 years later the government still has not accomplished this and have allocated less than 5% of the 2016 Appropriation Bill towards healthcare this year. Why does this matter? Because Nigerian women, men, and children are dying from treatable and preventable diseases and illnesses every day. On the 15th anniversary of the Abuja Declaration, we launched our Make Naija Stronger campaign, which fights for improved access to lifesaving health services for all Nigerians. 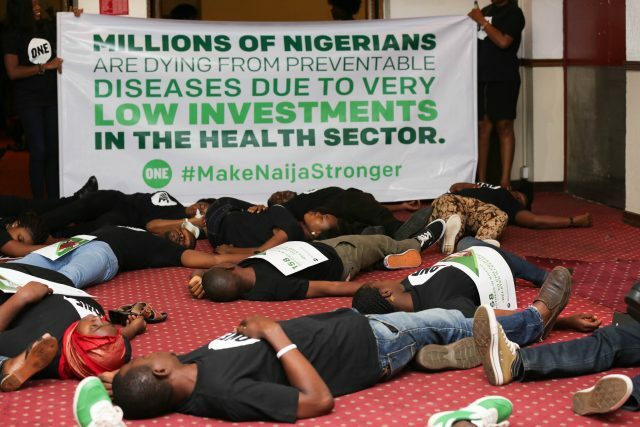 On the day of the launch, our ONE team staged an emotional die-in to represent the death of Nigerian citizens due to poor health care and famous Nigerian singer, Waje, signed ONE’s Make Naija Stronger petition. Since the launch of the campaign 7 weeks ago, our Make Naija Stronger video has been watched by tens of thousands of viewers and over 5000 people have signed the petition! Our supporters have presented such a strong force that the Nigerian government has invited ONE to participate in the development and implementation of the National Health Act (NHA). The ONE Africa team will help the government educate the public about the benefits and importance of the NHA, as well as assist with the development of analytic frameworks and a plan for the implementation of the NHA. We have already made great progress in our mission, but our work is not finished yet – we still need YOUR HELP to improve Nigeria’s health care! So, what can you do to #MakeNaijaStronger? We need 100,000 signatures on our petition before we can present it to the Nigerian government. Show the government that you want ALL Nigerians to have access to lifesaving health care by adding your signature right now! 2. Share the Make Naija Stronger video! The Nigerian healthcare system is letting down more than its patients, it’s also hurting the lives of friends and family members who needlessly grieve and suffer emotionally. It is essential for the world to understand the devastating effects that poor healthcare has on individuals and communities so they too will take action against inadequate health systems. Share the video and encourage your friends and family to take action by signing the petition so the government knows you want better healthcare for all Nigerians. 3. Be an active citizen! We need ONE supporters to speak up in their communities and show the government that we have a voice. Asking your government how the budget is spent and who is responsible for delivering essential health services shows them that these issues matter to YOU! How can you do this? Contact your local government representatives through social media or request a meeting and speak to your representatives in-person to talk about your concerns and questions. Policy makers cannot ignore passionate, involved citizens, so get out there and start the conversation! 4. Become a ONE Member! Being a ONE Member means you’ll get important campaign news and updates delivered straight to your inbox. We still have more videos to share with you and will be launching a letter writing campaign that you definitely won’t want to miss out on! Click here to sign up and stay tuned! Together we can Make Naija Stronger! Join the movement of people who are demanding better from the Nigerian government and sign the petition today.